Where he likes to build the biggest fires known to man. Rod is the other Goldfish Poodle I’ve mentioned a few times and weekends at his place pretty much always include some sort of incident. There've been many random events with his gigantic family, tubing excursions with 50 people down the Shenandoah river, taxidermied fish falling into bathtubs with people, beauty pageants, Robot Festivals, and many things involving Fire and Christmas Trees. Rod also has a great voice, and sings at various local events. A couple times, I’ve sang back-up for him, which is what I did again this past Saturday. At the Annual Jefferson County Fireworks Show. As you can imagine, a county show brings in a diverse crowd...And most of the people are just nice families enjoying a good funnel cake. But you do get to learn fun local customs like when Security explained why we couldn't bring in two little dogs. Because the rules for the show are, "No Dogs....No Firearms." Ah, makes sense since I'm never with a dog WITHOUT a firearm. And that sort of thing will make it totally worth being without your dog and firearm, let me tell ya. Fast forward to later that night, back at the Estate, where Rod informs us he has two leftover Christmas Trees that are good and crispy in his yard. And we gunna burn 'em. FACEBOOK• 9:46pm Rod posts: "At this moment I have two dead Christmas trees tied to my bumper, dragging behind my Chrysler 300. This fire is going to be epic." We get to the cabin, and the grass is up to our knees. We can’t even FIND the circle where he normally has bonfires. 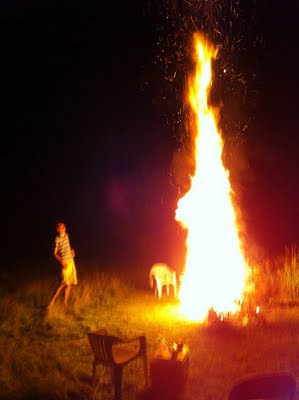 We get out, trudge over, and start worrying about ticks...and about setting his entire property on fire. But we start to find chairs to sit in anyway, and Rod starts a LITTLE fire. So we move our chairs back. And our friend Gina is moving away and wants to get rid of old checkbooks, etc. so she brings those and we start basically destroying any evidence she ever existed in D.C. -which is fun!- but we all discuss that MAYBE since the grass is knee high and the insects are crazy - and ticks carry Lyme Disease – that we’ll forgo the Tree Burning this time and just destroy Gina’s identity and call it a night. Then Rod decides: 11 pm on a Saturday night is a great time to Get Out The Mower! But he can’t find the headlights, so we only HEAR him coming. TOWARDS US. And now we're deer in headlights...or, NOT in headlights as it were...and we wonder "should we scatter??" Then I suggest we stay by the fire so maybe he has a better chance of seeing us. So now we’re standing around a fire, peering into darkness towards a machine with rotating blades coming toward us - that we can only hear - and we're still beating down grass around our feet, slapping mosquitos, and looking for ticks. And this whole time, there’s a random white SUV parked with it’s lights on farther down the yard beside Rod’s pond. And I finally HAVE to ask, “um...do we know who those people are?”. Nope! Apparently people randomly trespass all the time in the country and it’s normal. What a lovely addition to all this! They eventually leave - probably realizing: That Kid With The Fire And The Mower Is CRAZY! -but we, That Kid's Friends, are trapped around the fire lest we wander off and get run over by a machine that we can't see. We finally DO see him...and move our chairs back. And he mows a circle around the fire and we move our chairs back in. And this whole time, you can see the internal struggle in Rod. He. Wants. Those. Trees. And at one point, he has his hand on one and is looking at the fire – and I just know: those trees are toast. And the first tree goes on the fire. And honestly, it’s not that bad. So we all move our chairs back in and settle in—and Rod goes for the second one. Woah, woah buddy! How about we wait for the first one to finish before we throw another TREE on the fire? And finally, he can’t take it anymore and decides it’s time. That is Rod, maniacally laughing off to the side. Rod is about 6’6 – so you see how tall the flame is. Yes. A 15 foot flame shooting straight into the air WAS a little different than the first, fairly calm inferno. And that, ladies and gentleman, is how you celebrate the 4th of July in West Virginia.